The country especially the southern parts have seen one of the most unusual winter of all time. It would not be wrong to say that it was the most wettest winter for the southern areas as every month brought heavy downpour along with it. This unusual trend started from the month of December last year and continued till the month of April. What was supposed to be dry, was wet! December 13, 2012: Early morning Heavy thunder downpour with gusty winds especially in southern parts. 32 mm rainfall recorded. December 15, 2012: Brief shower in the north. Traces reported. January 15: Drizzle at night in south-eastern areas. Traces reported. January 17: Light shower in North-western areas. Traces reported. February 4: Heavy thunder downpour along with hail, rain occurred in the south-eastern parts while hail occurred in the northern areas. The highest rainfall was 32 mm. February 15: Thunder rainfall with hail, hail occurred in the western and central parts. A total of 14 mm rainfall was recorded. February 23: Drizzle occurred, traces were reported. March 6: Drizzle occurred in the North-western areas of the city. 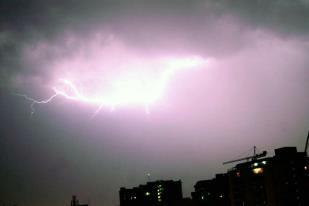 March 27: Heavy thunder downpour at night, the rain was intense in the southern areas of the city. A total of 32 mm rainfall was recorded. 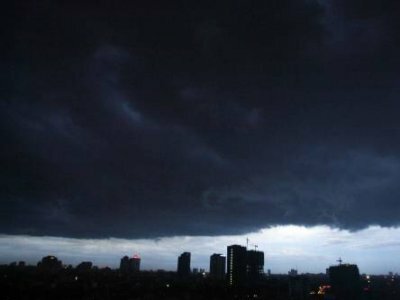 April 2: Rain with thunder/lightening along with dust storm occurred in the city at night. 13 mm rainfall was recorded, hail occurred in the north-eastern areas. April 8: Rain at times heavy with thunder occurred in the city, light showers occurred in the eastern areas. 28 mm rainfall was recorded. April 22: Very heavy thunder downpour occurred across the city with strong winds and hail. 41 mm rainfall was recorded. April 23: Drizzle occurred in the city. Traces were reported. April 24: Drizzle occurred in the city. The average rainfall of Karachi from the month of December till April is only 27.7 mm however this time it got 192 mm rainfall. Karachi’s average monsoon rainfall from the month of June till September is 136.5 mm, so if those rains occurred in the monsoon season then we already have a near monsoon rain. Heavy torrential rainfall had lashed Makran coast during the past months including Gwadar causing the death of five people, heavy flooding occurred in Gwadar and Kech district where shops were submerged under storm water while several walls had collapsed. It had been said that 20 years old year record of hailstorm has been broken in north-western areas of Balochistan, the storm caused the death of 5 people. The province of Punjab and Khyber Pakhtunkhwa received near normal winter/spring rains. Will the upcoming monsoon season be affected? Normally it is believed that wet winter season means a dry summer season but it is not necessary. In the 21st century that is 2003 and 2006, overall a wet winter season was seen across the country followed by a similar wet summer season. Still there is a high probability that monsoon season might be affected as the heating trend before the summer season is a must. The heating trend of 2013 started from the first week of May and temperatures returned to their normal position. Lets see the year 2013 now! Indian Ocean Dipole problem – Should it be watched? As mentioned in the Part-1, Regional Institute for Climate Change (RIGC) at Tokyo, Japan has warned that a negative Indian Ocean Dipole (IOD) is developing that would become a resistance between the monsoon movement and could cause the monsoon to come to halt in August. Pakistan Weather Portal (PWP) believes that temperatures are rising in both the western and eastern areas of Indian ocean therefore the situation is little complex but no cause of worry however monsoon going on short break is common during the season. PWP will monitor the temperatures of western and eastern Indian ocean in June again. Sea temperatures rising and rising! Temperatures are higher in the Indian ocean as mentioned in the PWP’s article in early April which could favour any tropical activity in the both the basin that is Bay of Bengal and Arabian sea, temperatures are very high in the southern and south-western Bay of Bengal. Above 30°C have been recorded in the Bay of Bengal which could favour formation of a strong tropical cyclone during this week. Temperatures are rising in the Arabian sea as mentioned by PWP in early April, 29°C was the temperature recorded in south-eastern Arabian sea. Bay’s system could churn into a strong tropical cyclone. ← Vote for Pakistan – The country needs you! Which areas come in north east punjab? Lahore, Gujrat, Gujranwala, Norwal, Sialkot and other adjoining cities. so it,s again EL_Nino? or La Nina Can come back in September like 2012? Its mentioned in the article. very nice babar bhai. well done w8ing for next article. Thank you Ali 😀 The third article might take time, I made the two parts quick because I was late to publish these articles due to my unavability, last year I Published Monsoon part 1 in February and Part 2 in April. Babar bhai -ve indian ocean dipole causes above normal monsoon rains or below normal???? I mentioned this topic in the first Part. Nice article. So we can expect monsoon season to continue till mid September? 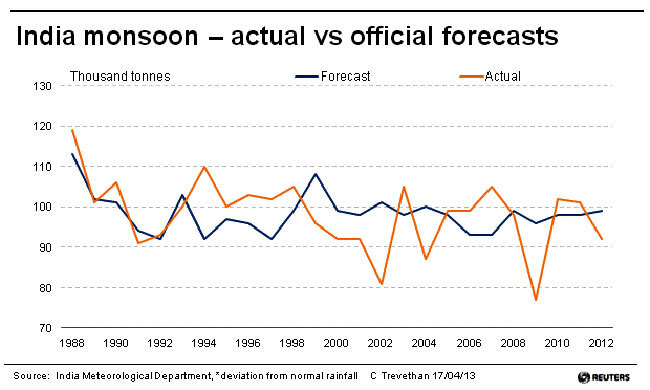 And are the chances of a strong monsoon being ruled out? Thank you Sameed 😀 It cant be said right now, since it has not started yet. Mentioned Karachi in southern parts. Normal seen as of now. Now, The only thing between me and my precious monsoon is my 2nd year examination (16th May – 3rd June) :D. Pray for me. Babar bhai i have heard that Khyber Pakhtunkhwa is not in the monsoon region. Is that true? and which areas of khyber pakhtunkhwa receives monsoon rainfall? Central and western parts are in Monsoon area, the south is not in monsoon zone. At the moment, near normal monsoon is seen however due to westerlies and easterlies interaction Islamabad gets good rain. yaar yeh Babar ache hamen mil gae warna Pakmet to aaen baen shaen hi karte rahe hain aur detailed kuch batate bhi nahi hain . Sir i have 2 questions 1@when will monsoon active in sindh i mean in july or late august?? 2@i know it is difficult for u to answer but iam asking can we expect similar rainy spells like 2011 in sindh?? 1. As I have written in the forecast, there is a slight possibility of pre-monsoon activity in Sindh. Monsoon could occur in second week, chance. 2. Last year the rains were spotty apart from that one record breaking rain that too occurred in Up Sindh. Overall the rains were below normal. This year condition could be better as comapred to last year. Babar bhai what about D.I.khan? same as southern areas or something different? Near Normal to normal monsoon. Is there a possibility of pre monsoon showers in isb.Are there chances of strong dust storms in isb and khaur. Strong Dust storms could occur in May and June however no chance of pre monsoon. Sir, what about 2013 monsoon in Karachi as well as cyclone. Mentioned in Southern areas. Cant say anything about cyclone yet. Quetta does not lie in Monsoon region though it can get some passing rain. Low level clouds represent increase in humid winds coming from Arabian sea which increases during/around the time of monsoon..